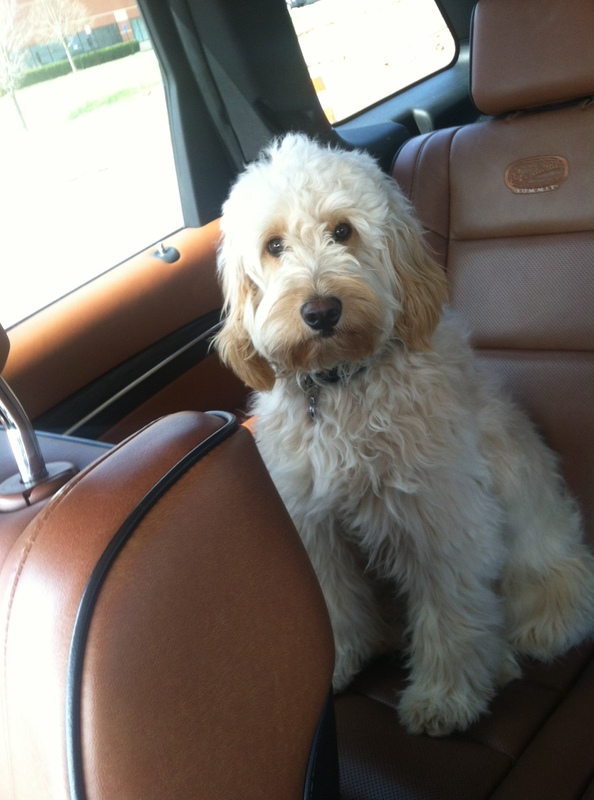 I’ve had 3 dogs as an adult: the latest one a gorgeous, sweet GoldenDoodle that learns new commands very quickly. She’s still only a year old, a little rambunctious, but otherwise well behaved. We’ve taught her to sit, lay down, fetch, and drop a ball on command. All good behavior. Unfortunately I’ve also inadvertently taught her that its ok to jump up on people when they walk in the door. It all started innocently. I was so excited to see her when I got home from work and I loved the attention she gave back. So now no matter who it is, she rears up and almost hugs you while she says hi. And I realized the other day that I trained both my X and my current husband how to treat me too. I’m a bit of a neat freak. Sure like any normal person I go through periods where my house is a wreck. I have my blind spots, like my bathroom sink is almost never tidy. But for the majority of the rest of the house I have high standards. No clutter, no dirt, everything in its place. Dishes should not rest in the sink, they should be in the dishwasher. Cloths should not be on floors, they should be in the laundry basket or if unused hung up. If you use something, when you are done put it away. Like the hiker moto: “Leave it as you found it”, one should remove all soda cans, trash, and extra items from the car at the conclusion of each journey. They have been trained that if they won’t stay organized and tidy, then I will do it for them. I will come home from long day at work and go straight to the sink to move the full days worth of dirty dishes to the dishwasher. I will pick up stranded towels and closet floors littered with cloths. I will grab the 4 or 5 cans and water bottles from the car to put them in the recycle bin. I will do all the laundry. I will straighten the house. I will cook. I will shop. I will work full time and I will end the day feeling drained and burdened. So I’m gonna try something new. Instead of letting my dog hug me when I arrive, I’m going to encourage her to stay down with treats and a firm command. And I’m going to do the same for everyone else in my life. Wish me luck because just like dog training, its training for me as much as for everyone else. Tell me, how do you do it? How do you train your family to be independent and live up to your standards or have you thrown in the towel? Oh No He Di-int! Oh Yes He Did! A, my 10 year old, is one of the funniest people I know. He catches a phrase, usually from TV but occasionally from friends and he applies it at the perfect moment. Usually it sends us all into convulsive laughter. So with that reaction, he says his new phrase again, and again. His latest is said with swag of the finger and a high pitched voice, “N to the O, girlfriend, oh no you di’int”. Coming from A its hilarious. X and I share a second home, not a great arrangement but we thought it was best not to take this pleasure away from the kids when we split. X was recently at the house with friends. When I arrived for my weekend there, with A and his brother and my current husband, I was flabbergasted. The place was a disaster. So I did what I always do and went straight into clean mode. While cleaning out the fridge that literally smelled like a dead body due to the 3 week old rotten milk, eggs and chicken left in there while the power was off, A sensed my frustration and asked, “Mommy what can I do to help?”. I gave him a soapy towel and said, “go wipe down the bathroom”. So, he wiped down the sink which was full of X’s body hair. Then A (remember he’s 10), called X and left this message: “I just had to clean your pubic hair up in the bathroom.” That was it, no judgement, no “it was so gross”. Oh no girlfriend, you di-int! Not a shining moment between father and son, but how naughty was it? So, X goes ballistic. He calls screaming to the point that both boys hang up on him. He didn’t ask for details or context, he just went off. Fast forward a week, and A is back at X’s house. X decided a grand punishment was in order. A is grounded from all TV, video games, devices including the phone I bought him to call me. Being grounded isn’t a big deal in most houses, but when you are 10, its summer, your friends and neighbors are away on vacation and your bother *is* allowed to do all those things, it’s hard. Ok that’s what X was going for, a hard lesson. I get that. But after ensuring the kid is bored to death, he doesn’t try to help. X goes to work in his home office and proceeds to do his usual, ‘Ignore-The-Kids’ thing all day. A is miserable. He keeps calling me telling me how much he misses me. He says he will run away if we don’t take him to our house. I’ve coaxed his brother into putting away his device and playing board games and I talked A into finding a book, that helped a bit. But now in the second day, seemingly nothing can take A’s misery away. We’ve talked 14 times in 24 hours. A hides in his room and calls me from the home phone. Lets hope he doesn’t get caught. So my biggest regret, you ask? I left my marriage because my husband was a manipulative, mean, egotistical man who worked or cruised the internet 24×7 and didn’t hear my pleas for attention. I couldn’t convince him to spend time with family. What I didn’t realize is how many times I would be sitting here thinking: now I left my kids to deal with THAT! What was I thinking? Why didn’t I play this chess game out further and realize at least when I was there I had some control? I could help my kids through. Its my fault they are miserable and there is NOTHING I can do about it. I know A will survive. In fact, this will toughen him up. In life there are many people like this you have to deal with. At least we can use it to learn something, right? So, I ask you, what would you do? This entry was posted in Uncategorized and tagged Divorce, divorce blog, Joint custody, life after divorce, x-husband on August 3, 2013 by DivorcedAndNoLongerAshamed. nicoledgillen on Sit. Stay. Go Fetch.